ENGAGE! Napa Valley Arts in April opens with a weekend of artists showing work at the ENGAGE Art Fair. Now in its seventh year, Napa Valley Arts in April is the county's annual month-long showcase of arts and events that highlights local talent amid world-class exhibitions. Produced by the Arts Council Napa Valley, Arts in April is changing the script for this year's offerings and collaborating directly with community partners in each town in the valley—American Canyon, Napa, Yountville, St. Helena and Calistoga—to bring art directly to the people with programming that's largely free, family-friendly and accessible to all. "We invited all of the arts and cultural stakeholders that we knew in each town," says Arts in April producer Danielle Smith. "And told them, 'We think it's important to create programming that reflects the unique culture of your town.'" With that in mind, the upcoming schedule of events embraces each town's cultural personality. 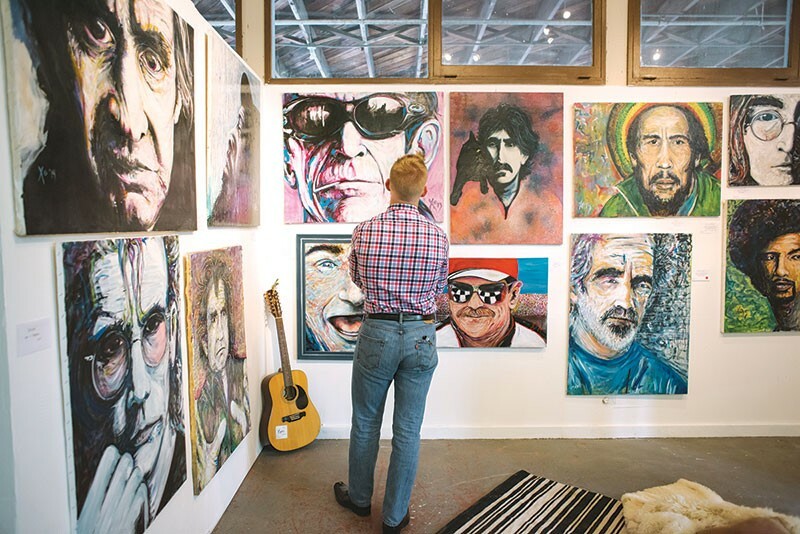 For example, Arts in April kicks off the month with a four-day grassroots celebration, "Sarafornia: The Arts of Calistoga," that honors the town's bohemian spirit. Throughout the weekend, the Napa County Fairgrounds in Calistoga will house the ENGAGE Art Fair, an interactive way to meet dozens of local artists and see them working in an eclectic environment of creativity. In addition, the exhibition "Flower Bomb" at T-Vine Winery features several local florists pairing their artistic bouquets with a variety of paintings. And on Saturday, April 1, Tank Garage Winery hosts a Storytelling Speakeasy. "Speakeasies are those place where people go to feel safe," Smith says, "where outsiders congregate to share their art in a place where they feel they can be vulnerable." The events were planned before the current administration announced its intention to dismantle the National Endowment for the Arts, which is a source of Arts Council Napa Valley's funding. Smith recognizes that many of these events have now taken on a new meaning. "I think there needs to be a cultural shift in this country," Smith says. "Most Western civilizations treat the arts as something that's essential." After Calistoga's bohemian weekend, Arts in April celebrates Napa Valley's diverse scene with events like Art, Sip & Stroll in Yountville on April 22 and FLOW: Arts at the River in Napa on April 30, where partner Festival Napa Valley presents performance art on stage while local students work on a public art piece. Smith also says that anybody can basically join Arts in April by putting their event on the Arts in April's online calendar. "To see a community rally around the idea of doing something for the arts, to stand up and say this matters to them, is awesome," Smith says. For more info, visit artscouncilnapavalley.org/artsinapril.